Peel and halve the red onions, then finely slice. On a side burner or stovetop, heat the olive oil in a saucepan on high heat. Add the onions. Cook the onions for 3 minutes or until softened. Reduce the burner to a medium heat. Add the balsamic vinegar, brown sugar, salt and pepper. Cook for 5-10 minutes or until the onions have caramelised. Set aside to cool. Cut each sheet of pastry into 9 squares. Gently score a 1cm border in each of the squares, being careful not to cut all the way through. Using a pastry brush, brush the borders with the lightly beaten egg. Place a dessertspoonful of the caramelised onion in the middle of each square, ensuring the onion mixture is not on the borders. Crumble the gorgonzola on the top of the caramelised onion. Once the barbecue has preheated, make adjustments to the burner control(s) if required for the roasting setting. Place the tartlets on and cook for 12-15 minutes, or until the pastry is golden. 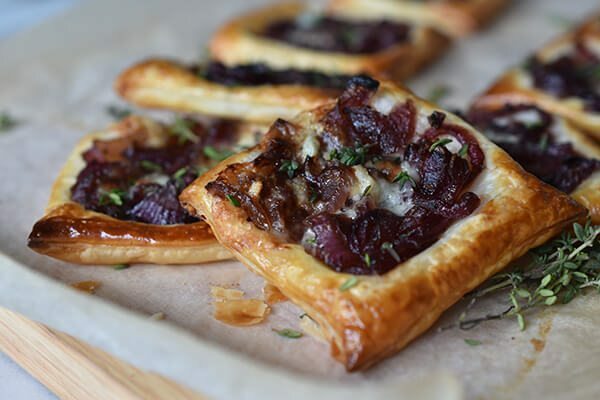 Remove the tartlets from the barbecue, leave to cool slightly and garnish with the fresh thyme.